The Saudi Arabia – Israel – Iran Triangle: Can Saudi Arabia Deliver the Goods? This article was published under the title “Il triangolo dell’Arabia Saudita” in Aspenia, the journal of the Aspen Institute Italia, No. 37, July 2007, pp. 84-98, just days after the Hamas bloody take over of the Gaza Strip. The Second Lebanon War (according to its official Israeli denomination), has dramatically changed the strategic landscape of the Middle East. To a large extent Israel, fighting on two fronts, was perceived by its moderate Sunni neighbors to be countering the spread of Islamist radicals, especially the pro-Iranian Shiite. Sunni Arab leaders have been feeling threatened before the crisis by what King Abdullah of Jordan called “The Shiite Crescent” stretching from Iran, across Iraq where the Shiite government is now in control, to Alawite ruled Syria, and to Hizballah in Lebanon. The fact that Israel has not succeeded to decisively defeat Hizballah and thus allowed its sponsors, Iran and Syria, to emerge as the winners of this confrontation, has persuaded the Sunni Arab moderate states - Egypt, Saudi Arabia, Jordan and the Gulf emirates - that they share a common enemy with Israel and they should find the way to challenge together the radical Shiite coalition. The Saudi leaders decided to invest their efforts in two major conflicts, also vital to Israeli strategic interests: the Lebanese and Palestinian arenas, besides their active involvement in the Iraqi arena. On December 26, 2006 a meeting took place between Saudi King Abdullah and a Hizballah delegation led by deputy leader Sheikh Naim Qassem, first such contact with the Shiite party. Following Saudi pressure on Hizballah during this meeting a draft agreement proposed by the Saudi Ambassador to Lebanon was drawn up between the March 14 Forces and Hizballah. The draft agreement reflected partial concessions by both sides: The March 14 Forces agreed that the international court for the assassination of former Lebanese prime minister Rafiq Al-Hariri would be re-approved by the future Lebanese national unity government only after a working group discussed the reservations of the opposition. Hizballah Secretary-General Hassan Nasrallah agreed that the future unity government would include 19 ministers from the March 14 Forces, 10 ministers from the opposition, and one more minister to be appointed only with the agreement of the March 14 Forces. Intensive contacts took place between Saudi Arabia and Iran, at the initiative of the latter, aimed at finding a resolution to the Lebanon crisis and preventing civil war. Iranian Supreme National Security Council Chairman Ali Larijani arrived at an agreement with the Saudi leadership in accordance with the accepted draft. However, on January 18, Nasrallah rejected the draft because it did not include acceptance for early parliamentary elections. On January 22, 2007, Larijani met with Syrian officials and a Hizballah delegation in Damascus and was heavily criticized for accepting the inclusion of the international court in the draft agreement. The talks ended with Syria's rejection of the draft agreement. As the Saudi leadership would not agree to change the draft, the escalation in Lebanon began. The Hizballah-led opposition threatened to escalate through violent protest to “paralyze life in Lebanon” and open the “second phase of the intifada.” In a speech on January 24, 2007, Nasrallah said referring to the Iran-Saudi contacts: "every agreement between two countries or two governments does not bind the Lebanese, because the Lebanese must seek their own interests and not the interests of Saudi Arabia and Iran." After several weeks of violent demonstrations and confrontations between the Siniora government’s law enforcement forces and the Hizballah–led opposition forces, by mid-April they were still at a stalemate, probably because Tehran advised Hizballah leaders not to escalate the situation as long as they hope to achieve some understanding with the Saudis and because the pressure on the nuclear issue at the Security Council. The two opposed Lebanese camps are apprehensive of a renewed civil war, try to avoid it but at the same time are preparing and arming for this extreme possibility in a near future. And then there is Syria, on Saudi Arabia’s black list since Hariri’s assassination. The rumors that Riyadh and Tehran negotiated a solution to the Lebanon crisis that left Damascus vulnerable to international sanctions did not materialize. According to American observers the Washington’s diplomatic engagement with Damascus during March 2007 “may be taken as a signal in the region that U.S. policy toward Syria is shifting. Sensing this, Arab states may be more conciliatory toward Damascus…undermining the already-tenuous international consensus on Syria. Israel and the major Sunni Arab states now appeared to share an enemy. But could they actually make common cause? The Arabs’ condition to Israel in order to confront Iran side by side with the Sunnis was to make peace with the Palestinians. The growing Iranian and Hizballah influence in the Hamas dominated Palestinian Authority (PA), clear Sunni territory, compelled the Saudi leadership to invest much more in regional diplomacy to counter the advance of the Iranian hegemonic ambitions. The Saudis acted on two levels: to pacify the escalating fighting between Fatah and Hamas, which threatened to degenerate into a civil war and spill over to Egypt and Jordan; to press on Israel the “old” Saudi plan for a comprehensive Arab-Israel peace. The Saudi diplomatic activism occurs at a time when Egypt's ability to be a broker in Israel-Palestinian relations has deteriorated significantly in Israeli eyes: Egypt continues to allow large quantities of arms to be smuggled from Sinai into Gaza; Cairo failed in the mediation between the warring Fatah and Hamas factions; it also failed until now in achieving an agreement on the issue of the Israeli kidnapped soldier in June 2006. On February 8, 2007 Saudi leaders brought warring Fatah and Hamas leaders together in Mecca to hammer out an agreement on a unity government that would end the internecine violence and the chaos in the Palestinian territories. Moreover, with PA president Mahmoud Abbas compromising on almost every critical issue “the agreement blurs the distinction between moderate and extremist in the Palestinian camp.” Hamas and Fatah officials have made clear that neither the recognition of Israel nor the renunciation of violence, the first two of the Quartet's conditions, are among the agreements clauses. Neither “Israel,” nor “peace process,” nor even the word "peace" appears in the accord. According to some reports, the Saudis tried to convince Hamas to accept the international community’s requirements to recognize Israel, accept previous agreements signed with it and renounce terrorism. King Abdullah urged the group to adopt a more pragmatic approach and told prime minister Haniya that the refusal of Hamas to accept the three conditions is harming the Palestinian cause. However, the Saudi calls for moderation have thus far been rejected by Hamas. Indeed, the Mecca agreement was a victory at points by Hamas leaders, who did not compromise on any of their ideological and strategic goals in exchange for a unity government which gave them the opportunity to obtain international legitimacy and financial support. With the Mecca Agreement, the Saudis chose to strengthen Hamas, at the expense of Mahmoud Abbas, who just became politically even more sidelined. The recently revived “Saudi initiative” is not new. It was first raised in February 2002 by the (then) Heir today King of Saudi Arabia through the columns of Thomas Friedman in the New York Times. The Arab League adopted the plan as its initiative for peace in the Middle East during the March 2002 summit in Beirut. - On March 27, 2002, the holy night of the Jewish Passover, a Hamas suicide bomber attacked the Park Hotel in Netanya killing 29 Israelis and wounding over 150. Two hours later the then Hamas leader Sheikh Ahmed Yassin appeared on TV and declared that the “martyrdom” operation was also a message to the Arab league leaders who that night had to decide on the Saudi plan at the Beirut summit. A Hamas statement also claimed that one purpose of the attack was to derail diplomatic initiatives. "The summit resolutions are below the aspirations and the sacrifices of the Palestinian people," said `Usama Hamdan, a Hamas spokesman in Beirut. This plan was endorsed at the Arab League summit in Riyadh on March 29, 2007. Significantly, PA Chairman Mahmoud Abbas voted in favor of the initiative, while prime minister Ismail Haniyeh of Hamas abstained. The proposal is similar to the original version; it supposedly offers Israel security and normalization in exchange for full withdrawal from “all occupied Arab territories” including the Golan Heights, the creation of an independent Palestinian state with East Jerusalem as its capital, and the “return” of Palestinian refugees. Contrary to Israeli expectations, both Arab League and Saudi officials say that no modifications will be made to the plan. The challenge will be for the Saudis to turn the Arab Peace Initiative into a proposal that is acceptable to Israel as a framework for negotiations. It has been reported that if Israel were to agree in principle to King Abdullah’s 2002 peace initiative, Saudi Arabia, Egypt, the United Arab Emirates and Jordan would establish a committee to repackage that plan with softened conditions, presumably regarding the right of return. The exact makeup of the Arab League delegation for the promotion of the Saudi peace initiative has not yet been determined, but the Palestinians, seconded by Egypt, hastened to demand that it not include representatives from countries that do not have diplomatic relations with Israel, leaving only Egypt and Jordan, and maybe Qatar. The Palestinians are seeking to avoid giving free “gifts” to Israel and trying to persuade it to accept the Saudi initiative as is. Some Israeli observers consider that “the flexibility demonstrated by the Arab League in changing its 2002 declarative statement regarding the initiative is of considerable significance” because it expresses willingness to translate the initiative into diplomatic action. This time around, the Arab countries are willing to advance a little further down the road to implementation of their initiative. Chances of success? Major problems ahead! Although it seems that the Saudi emerging regional leadership moved forward the negotiating process between Israel and the Arabs, the difficulties ahead are enormous. They pertain to the very essence of the inter-Arab relations, the multitude of actors involved in the Israeli-Palestinian conflict and the high strategic stakes for the radical coalition congregated around Iran. The complex situation in the PA. The fight for power between the secular Fatah and the Hamas government is not finished. Ongoing factional violence, albeit at a low level, including kidnappings and assassinations, could return the streets of Gaza to a state of war. The hardliner factions within each party continue to prepare for a future show of force. Hamas forces are expanding fast and getting more sophisticated weapons and training from Iran, limiting Mahmoud Abbas' ability to enforce any ceasefire in the Gaza Strip. Israel Defense Forces (IDF) Southern Command General Yoav Galant has confirmed previously unverified Palestinian reports that Iranian experts are training Palestinian terror organizations in the Gaza Strip. The Iranians are also the source of most of the know-how coming to the West Bank. The PA for its part, with the assistance of the U.S. security coordinator to the PA is implementing a plan of reinforcement of the Presidential Guard with weapons, ammunition, equipment, training and funds, and security at the Palestinian side of the Karni Crossing (the lifeline of the economy in the Gaza Strip). Egypt and Jordan have agreed to train the 1,500 soldiers of the Presidential Guard to be deployed in Gaza. Persian Gulf countries have agreed to provide additional funding for the plan. The unity government is likely to fracture along three issues: the mission and composition of the security forces, the distribution of PA offices, and the future of the PLO. Former Hamas foreign minister Mahmoud al-Zahar declared recently that Hamas opposes giving the PLO a mandate to negotiate with Israel until all Palestinian factions are represented in the organization, including Hamas and Palestinian Islamic Jihad, hinting that his organization has an independent position on truce terms with Israel.. The first serious fractures appeared in the second half of April 2007, when the Palestinian Interior Minister Hani Kawasmeh submitted his resignation because the lack of progress in carrying out his plan to bring law and order to the chaotic Palestinian territories. Prime minister Ismail Haniyeh refused to let him step down and Kawasmeh agreed to remain in the post. On April 24, for the first time in five months, the military wing of Hamas, the Iz al-Din al-Qassam brigades, claimed responsibility for a major Qassam attack on Israel in revenge to IDF operations over the weekend, in which nine Palestinians were killed. Abu Obaida, the spokesman of the Iz al-Din al-Qassam affirmed in a statement published on the group’s website that his group wanted to send a clear message to the IDF troops that any attempt to invade the Strip would cost them a “very high price” and that practically the self-imposed Palestinian truce was over. Hamas itself has split into three groups: the first led by Khaled Mashaal, the secretary general based in Damascus, who “made a strategic decision to ‘lower his profile’ as part of an effort to disguise himself as a moderate;” the second, the “rejectionists,” led by former interior minister Said Siam, former foreign minister Mahmoud Zahar and former Hamas spokesman Sami Abu Zuhri, accuses Haniyeh and Mashaal of betraying Hamas voters by agreeing to form a coalition with Fatah and claim that the Mecca agreement is nothing but a plot designed to remove Hamas from power; the third group, the most radical, based in Gaza, is led by Ahmed Jaabri, the head of the Iz al-Din al-Qassam brigades. If the current crisis in Hamas continues, the movement will find itself in a situation similar to that of Fatah, where infighting and schism have become the norm. The internal situation in Israel. While the Olmert government struggles to survive the dire consequences of the Second Lebanon War and badly needs a “political horizon”, or agenda, the Saudi plan seems to be the best game in town and the only hope for a revival of the negotiating peace process. While the Israeli political class, the military high command and the public opinion are anxiously awaiting the report of the inquiry commission on the war in Lebanon, as long as the signals from the Arab world, and especially from Saudi Arabia, concerning the proposed peace plan will seem uncompromising, especially on the refugee issue, it will be extremely difficult to advance on the mined path of the negotiations. For instance, shortly after the daily Haaretz quoting Israeli lawmakers visiting Jordan said King Abdullah had assured that the solution provided for in the Arab peace plan for the Palestinian refugee problem could take the form of paying only “compensation” to the refugees, the Jordanian royal court denied as “utterly baseless” the remarks attributed to the King. Positive signs can be seen in some liberal circles. On the eve of the summit in Riyadh, liberal author Mamoun Fandy described the Palestinian issue as one that has drained the energies of the Arab states for more than 50 years, and called the summit to remove the demand for the return of Palestinian refugees from the Arab peace initiative in order to arrive at a realistic solution to the Palestinian issue. Similarly, Saudi columnist Yousef Nasser Al-Sweidan argued that the Palestinian refugees' right of return is an idea that cannot be implemented, and that the only solution is for the refugees to be naturalized in the countries where they currently reside. The risks of the disruption of the process by radical actors. “The axis of destabilization,” as this author characterizes the radical players - Hizballah, Syria and Hamas led by Iran - and small Palestinian factions who identify themselves with al-Qaeda, can disrupt at any moment the fragile process started in Mecca and Ryadh by staging major terrorist attacks inside Israel, or through the southern or northern borders. It should be remember that the kidnapping of Gilad Shalit to Gaza happened in June 2006 one day before the signing of the Fatah – Hamas “prisoners’ document” which was intended to permit the constitution of the Palestinian governing coalition but produced instead a devastating Israeli military operation in Gaza. The future of the US presence in Iraq, the reactions of Iran to the growing international pressure or to perceived signs of an imminent American military strike against its nuclear project, the opening of the international tribunal in the case of Hariri’s assassination, practical measures against Hizballah’s rearmament or for its disarmament, Hamas’ leadership feeling that Fatah could try a “putsch”, could bring the kind of terrorist reaction which could indeed derail the process. Several knowledgeable Israeli analysts suggest a cautious but positive approach to the Saudi initiative and the moderate [Sunni] Arab axis it leads. This author advocates a similar approach but warns of the danger to leave the moderates’ decision on the peace process in the hands of the Arab League as a unified body. The historical experience shows that the decisions adopted by this heterogeneous forum correspond to the lowest common denominator and therefore cannot offer the necessary compromise with the Israeli stand. Giving for instance Syria an almost veto power over the rest of the moderate camp will obviously not advance the Saudi initiative. In the same vain, to build on the “moderation and pragmatism” of a Fatah-Hamas alliance in order to achieve any agreement with Israel, means not to understand the very essence of a radical Islamist movement whose ideology is based on religious precepts. If it took the secular Fatah (and not all of Fatah) nineteen years to change its ideology and strategy vis-à-vis Israel, how many years will need the Hamas leadership to change its own? Israel and the international community should not be afraid of a serious split in the Hamas and should take action to hasten it. Only if a real pragmatic moderate camp will emerge in the Islamist camp in Gaza and the West Bank, which will ally with the Palestinian secular camp and engage in an all out showdown with the radicals, is there a chance for a gradual successful peace process with Israel. The grim evaluations expressed in this article, finalized by the end of April, materialized just in mid-May 2007. Only three months after the Mecca agreement brokered by the Saudis, the Hamas-Fatah bloodletting erupted again. As predicted, the unity government arrangement was flawed from the outset, leaving the cardinal issue of who would exert control over the Palestinian security forces unresolved, and so planted the seeds for the latest surge of violence. The factional violence between Hamas and Fatah began on May 13 in the Gaza Strip, with street battles claiming close to 50 lives. In one of the bloodiest incidents, five Fatah guards were gunned down when Hamas militants stormed the home of Abbas's top security chief in Gaza, Rashid Abu Shbak and a few hours later Hamas militants fired mortar shells at the compound housing Abbas's office in Gaza. The bloodshed endangers “not only the unity government, but the Palestinian social fabric, the Palestinian cause and the Palestinian strategy as a whole," according to Saeb Erekat, a close associate of Palestinian President Mahmoud Abbas. Rival Palestinian factions agreed to end all hostilities, but members of both Hamas and Fatah claim that internal infighting is far from over. “The Israeli attacks will only postpone the internal fighting but will not end it," said senior Fatah official Ziad Abu Ein.” Islam Shahwan, spokesman for Hamas's Executive Force, agreed. "Despite the Zionist attacks, fighting…will not end because they [Fatah] have a plan to destroy the Executive Force.” Some Palestinians believe the only lasting solution will be to hold another round of elections. “We need to resolve differences through democratic means and not through power-sharing between Fatah and Hamas,” said independent lawmaker Hanan Ashrawi. In this latest violence the better-armed Hamas militants have held the upper hand, with Fatah forces suffering most of the casualties. The Hamas leaders decided therefore to use this advantage and at the same time persuade the battered Palestinian population that they continue to fight the main enemy, Israel. On May 15 and 16, while dozens of Fatah militants were fired upon or even executed in cold blood, Hamas opened a wave of Qassam rocket salvos on Israeli territory hoping to drive Israeli forces inside the strip. Neither the Israeli government nor the military are eager to reoccupy all of Gaza in order to eradicate the Hamas and other terrorist infrastructures in Gaza, knowing well the high price the army and the Palestinian population would pay in such a scenario. Such a move would also implicate strong criticism from the international community, especially Europe. Therefore, it chose a staged strategy of military escalation, first by targeting Hamas militants responsible for the rocket attacks by the air force rather than involving ground troops. As the firing of dozens of rockets into southern Israel continues, the next stage involves the targeting of senior “military” and political Hamas leaders, a strategy that succeeded to bring long periods of calm after the February – March 1996 wave of suicide bombings and after the worst waves of suicide attacks at the peak of the al-Aqsa intifada in 2003/4. Even Egyptian President Hosni Mubarak expressed great concern over the increasing strength of Hamas, declaring that the organization will never sign a peace agreement with Israel. He said that the Egyptian government is at a loss regarding the future of the Gaza Strip. Mubarak also said that Egypt did not accept Hamas in power, especially in light of its growing ties with the Muslim Brotherhood, which leads the opposition in Egypt. Without entering into the intricacies of the Fatah al-Islam fighting the Lebanese army in the Nahr al Bared refugee camp near Tripoli, it is of note that these bloody incidents, which provoked already dozens of casualties on both sides and the flight of thousands of Palestinians from the camp, occur just when the Security Council has to decide on the international tribunal for the assassination of Rafiq al-Hariri, fiercely opposed by Syria. the risks of disruption of the regional conflicts greater than ever. In these conditions it is difficult to see any positive political negotiated horizon as long as the radicals are not seriously challenged and convinced that their disruptive policies have no chance to succeed. See King Abdullah’s interview in Al-Riyadh (Saudi Arabia), January 28, 2007, cited in Y. Carmon, H. Varulkar, Y. Mansharof, and Y. Yehoshua, “The Middle East on a Collision Course (2): The Saudi Position,” MEMRI, Inquiry and Analysis Series, No. 320, January 31, 2007. Claire Spencer, “Toward a genuinely new Middle East?” In Arab state fragmentation, bitterlemons-international.org, Middle East Roundtable, Ed. 10, Vol. 5, March 8, 2007. Interview with Nawaf Obaid, Middle East Roundtable, bitterlemons-international.org,, Ed. 35, Vol. 4, September 14, 2006. London Al-Hayat, January 24, 2007. 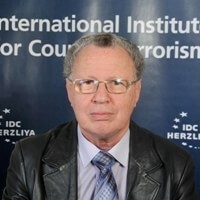 H. Varulker, “The Middle East on a Collision Course (1): Recent Saudi-Iranian Contacts to Resolve the Lebanon Crisis,” MEMRI, Inquiry and Analysis Series, No. 320, January 31, 2007. David Schenker and Simon Henderson, “The Riyadh Arab Summit: Multiple Issues and High Expectations,” PolicyWatch, No. 1215, March 27, 2007. Yossi Alpher, “Could Israel Make Common Cause With Sunni Arabs?” The Forward, February 9, 2007. Y. Carmon, H. Varulkar, Y. Mansharof, and Y. Yehoshua, The Middle East on a Collision Course (2). “After Mecca: Engaging Hamas” Crisis Group Middle East Report N°62, February 28, 2007. Joseph Kostiner, “Saudi Regional Strategy. The Power of Mediation,” Tel Aviv Notes, The Moshe Dayan Center for Middle Eastern and African Studies, Tel Aviv University, March 25, 2007. Robert Satloff, “The Mecca Accord (Part I): The Victory of Unity over Progress,” PolicyWatch, No. 1195, February 12, 2007. Nathan Guttman, “Saudis Push Bush Team On Peace Plan. Riyadh Assuring Palestinians That Arab States Will Back Deal,” The Forward, January 19, 2007. Thomas L. Friedman, “An Intriguing Signal From the Saudi Crown Prince,” New York Times, February 17, 2002. Hussein Dakroub, “Militant Palestinian Groups Reject Arab Peace Overture to Israel,” Associated Press, March 28, 2002. The reason for this added amendment was that Resolution 194 refers to compensation for refugees “choosing not to return,” implying that they should be given a choice. The phrase “special circumstances” refers to the Lebanese constitution, which bans the patriation of refugees. Thus, with respect to the 350,000 Palestinian refugees in Lebanon, the Arab League resolution calls not for their “right of return” (as the Palestinian delegation lobbied for), but mandates that they must be settled in Israel. See Gary C. Gambill, “Syria and the Saudi Peace Initiative,” Middle East Intelligence Bulletin, Vol. 4 No. 3, March/April 2002. Zvi Bar'el, “No free 'gifts' to Israel,” Haaretz, April 15, 2007. “U.S. : With Iranian help, Hamas forces growing faster than Fatah,” Reuters, March 21, 2007. Amos Harel, “Senior IDF officer confirms Iran training militants in Gaza,” Haaretz, April 22, 2007. Aluf Ben and Avi Issacharoff, “Israel backs U.S. plan to arm pro-Abbas forces,” Haaretz, April 16, 2007. Mohammad Yaghi, “How Long Can the Palestinian Unity Government Last?” PolicyWatch, No. 1219, April 4, 2007. “PA Interior Minister rescinds resignation at Haniyeh's request,” AP as quoted by Haaretz, April 23, 2007. “Qassam Brigades announces end of fragile truce, blames Israeli occupation,” at http://www.palestine-info.com/en/. Yaakov Katz and Khaled Abu Toameh, “Possible Hamas split worries Israel,” The Jerusalem Post, April 12, 2007. Aluf Ben, Avi Issacharoff, Yoav Stern, “PM: Willing to dialog with any bloc of Arab states,” Haaretz, April 15, 2007. “Jordan denies remarks ascribed to Abdullah on right of return,” Haaretz, April 24, 2007. “Liberal Author Mamoun Fandy: Adding of the Right of Return to the Saudi Initiative Changed It From ‘The Start of an Earnest Dialogue' to 'An Initiative Impossible to Implement',” MEMRI Special Dispatch Series, No. 1525, March 29, 2007. The views were published in two recent articles in the Kuwaiti daily Al-Siyassa, See ”Saudi Columnist: The Right of Return Is an Illusion,” MEMRI Special Dispatch Series, No. 1540, April 12, 2007. Yossi Alpher, “Radical Visions of A New Middle East,” The Forward, September 8, 2006. Alexander Bligh, “The Saudi Initiative: A Starting Point for an Israeli-Saudi Dialogue?” BESA Perspectives Paper No. 26, March 27, 2007, at http://www.biu.ac.il/SOC/besa/perspectives26.html. Dore Gold, “The Failure of the Riyadh Summit” The Jerusalem Center for Public Affairs papers, Vol. 6, No. 27, April 1, 2007. The Fatah website in English proclaims that the movement’s goal is the “Complete liberation of Palestine, and eradication of Zionist economic, political, military and cultural existence (Article 12)” to be achieved by “Armed public revolution [,] the inevitable method to liberating Palestine (Article 17).’ See at http://www.fateh.net/e_public/constitution.htm#Goals. Peter Hirschberg, ”Hara-Kiri Palestinian Style,” Inter Press Service News Agency, May 18, 2007. Avi Issacharoff, “Hamas, Fatah officials: Internal fighting in Gaza is far from over,” Haaretz, May 21, 2007. Barak Ravid, “Mubarak: Hamas will never sign a peace agreement with Israel,” Haaretz, May 17, 2007. Fatah al Islam is based in the Palestinian camp of Nahr al Bared in Northern Tripoli, Lebanon’s second largest city with a Sunni majority. The group is an offshoot of another previously formed group, Fatah al Intifada, both dissidents from the Palestinian Fatah and both backed and financed by the Syrian intelligence. But Fatah al Islam, formed last November and headed by Palestinian-born Shaker Absi, is linked directly to al Qaeda and has been cooperating with Abu Musab al Zarqawi, the [dead] leader of al-Qaeda in Iraq. See Walid Phares, “Al Qaeda's New Front in Lebanon,” Counterterrorism Blog, May 21, 2007 at http://counterterrorismblog.org/2007/05/print/al_qaedas_new_front_in_lebanon.php.